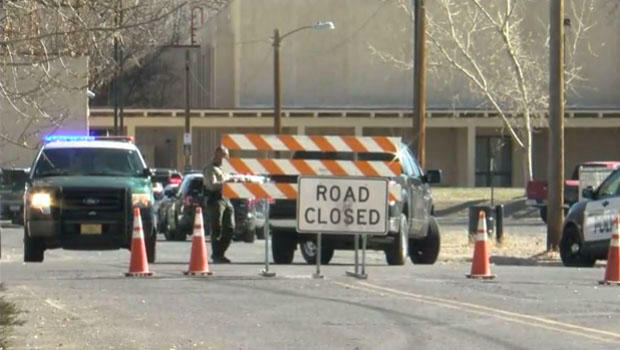 AZTEC, N.M. – Students hid in their classrooms, some behind locked doors, as a suspect opened fire Thursday inside a New Mexico high school, killing two classmates before ending up dead. Authorities and other officials in the small town of Aztec near the Colorado border have released few details other than to say the shooter and the two victims all attended Aztec High School. No other injuries were reported, and it was not clear if the shooter died by suicide or was killed by police. Local and federal authorities are investigating what led to the shooting and did not immediately release any details about the circumstances. Authorities haven't identified the shooter or the victims. Sophomore Garrett Parker told Albuquerque television station KOAT that he was upstairs in history class when he heard what he initially thought was students banging on lockers. As the noise got louder and closer, school officials issued a warning over the loud speaker. Parker said it felt like a dream. Some parents reported hearing from their children via text messages that they could hear the shooter approaching. A crowd of nervous parents gathered at Aztec City Hall to wait for more information as officers tried to reassure them about the safety of their children. Other schools in the area also were locked down as a precaution. Authorities say it could be a few hours before the lockdowns are lifted. Speaking at a press conference Thursday afternoon, New Mexico governor Susana Martinez said she "cannot imagine experiencing what those kiddos and staff and teachers did today." "Healing will take time," she said. Aztec police chief Mike Heal praised the first responders who he said were at the scene in less than a minute, crediting them with helping save lives. "This is a horrific event that occurred within our city, it's something we hoped would never occur," Heal said. "Our love and thoughts and prayers go out to those families who lost two children. It's a terrible day." Heal also said "heroes" at the school prevented further bloodshed, and said their stories would emerge within the coming days. Martinez also referenced "acts of bravery" and said that school staff and law enforcement jumped in quickly to prevent more deaths. She did not provide any details. Martinez described the day as difficult and called the shooting a heinous and horrific act. She called for New Mexicans to unite and support the small community of Aztec. Michael Padilla, a former Aztec school board member, told CBS affiliate KRQE the violence is unheard of in their small community. "Tragically the horrors that visited many other communities have come to roost here in Aztec," Padilla said. Padilla called the scene "chaotic" and said there was a massive law enforcement presence.